In the series' 100th episode, Coulson finally reveals the mysterious deal he made with Ghost Rider, which impacts everyone on the S.H.I.E.L.D. team. The beacon is not yet the Earth shattering kaboom we've been promised but does manage to be a dimension shattering kaboom, opening up fractures to a Fear Dimension(tm) because that's the kind of thing that happens around this team. Why can't we ever have a puppies and kittens dimension? Mack and Yo-Yo try to work out what do as Deke and Daisy run into what will be the first of many fear dimension hallucinations. Whatever is scary is bubbling up from the basement, and someone is going to have to go down there with a giant roll of duct tape a Gravitonium MacGuffin (but I repeat myself.) 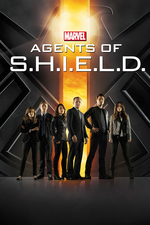 May, Daisy and Coulson argue about who is most expendable until Coulson faints to move the story along. It turns out that Coulson is not dying of Kree poison, but is relapsing to his original death at Loki's hands, the price of his deal with Ghost Rider. Surface-side, Deke goes around running errands, leaving a lot of voice mails. Coulsdon goes into the basement alone, and is nearly derailed by a fear hallucination when the real Deathlok shows up and the two of them are able to seal the rift without further casualties. It turns out Deke's calls were to the scattered remnants of S.H.I.E.L.D. allies and loyalists. General Hale works out that if Daisy was clearing someone out of jail, maybe she should look into that person. Fitzsimmons finally get married in Deke's pastoral terror-field, with a ring Deke picked up on the surface that reminded him of his grandmother's ring, causing everyone who has ever read a time travel story before to realize that Deke is Fitzsimmons' grandson. Sure enough, General Hale gets a genetic scan on him, which does not turn up anyone native to this timeline, but does match... Jemma and Leo. Hey! Fitz and Simmons will be together long enough to have a child! So, at least one more episode before they're tragically separated for dramatic effect. I was so confused when they suddenly had a wedding. SO CONFUSED. I was mostly confused when they had a wedding and nothing bad happened in the middle. Yeah, unexpected wedding (shows normally hype that kind of thing, I guess tv viewers love weddings?) in which, unexpectedly, nothing horrifying happens? I least expected it. That somehow made Deke less unappealing. He's kind of like Mon El from Shoehorn. The actor is affable, but the character is goawayplease. I enjoyed the wedding interaction between Deke and Deathlok. I wonder if that was improvised? If so I'd love to see the stuff they didn't use. I need Yoyo to get her arms back. When the interdimensional rift appeared I half expected Amy Pond to peek through. Right? "If this all ends up with the Pandorica...."
I enjoyed the way they left it possible that this really is all Coulson hallucinating on the surgical table. Possibly even selling it more by having the sudden convenient save show up. But Coulson didn't show up in Age of Ultron? Sure, the secret helicarrier that was explained after the fact in AoS did, but Coulson wasn't on it, that we saw. I thought this was a great episode in the way it tied a lot of things from the entirety of the series run together, starting with the opening credits cycling through the standard/Ghost Rider/LMD/Hydra/Future logo treatments. It was funny how Fitz immediately figured out the fear dimension just based on some video.